There are ceremonies for all successful hunts, when you get a seal or walrus. It is usually the hunting captain and his assistants who will thank the ocean for the gift. 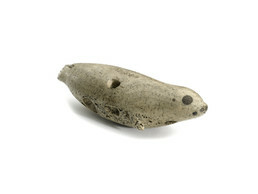 This fat-bodied seal, carved from walrus ivory, was probably a hunting charm. When suspended, the seal tilts downward as if diving.